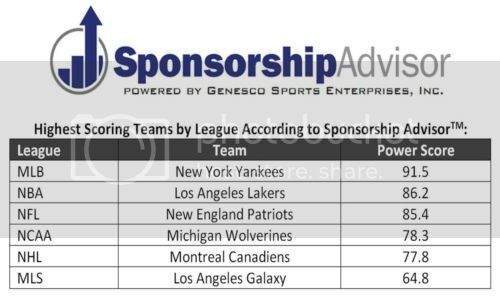 Sports marketing agency, Genesco, which reps well-known sponsors like MillerCoors, Pepsi and others has launched a new, web-based tool that it says will help quantify which pro and college sports teams are the most valuable from a sponsorship perspective. Ranking teams off the field isn't as cut and dry as wins and losses so Genesco says that clients will be able to adjust different weights to various criteria based on their objectives. Sponsorship Advisor it says will rate each sports team on a scale of 1-to-100 and assign an overall score based on things like impact, stature and fan avidity. The New York Yankees debuted atop the rankings. "This is a tool that will help our clients and other companies active in sports sponsorship make smarter investment decisions that are based on quantifiable data," said John Tatum, co-founder and CEO of Genesco Sports Enterprises. Charles Rode, Director - GSE Research and Insights, goes on to say that the tool is primarily geared towards brands that may want to evaluate teams from the buy-side, but that they acknowledge teams may also want to subscribe in order to use their score as a sales tool. The big key here is that unlike other property evaluation tools, Genesco isn't looking to take a cut of a potential deal from the property. When evaluation tools try to both give a Klout-like score to a property and then take a commission from the deal this score generates, there's a inherent conflict of interest as the most expensive properties generate the highest commissions for the evaluator. This not only damages smaller properties, but also hurts sponsors who may be getting scores and recommendations influenced by deal size, rather than best fit. The good news is that this doesn't seem to be the case with Genesco's Sponsorship Advisor, which is a tool developed for its corporate clients that could ultimately become a useful addition to the many services it's already offering them.